Save Money With a Ductless Heat Pump | Clean Air Act Inc. The primary money-saving functions of a ductless heat pump are in the concept of the system itself. What do we mean by this? 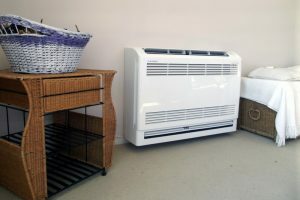 Ductless heat pumps have one outdoor unit, and then one additional indoor unit for every room that needs to be cooled. Combine that with individual control for each indoor unit, and you have a flexible and completely customizable AC experience. There are many types of families and lifestyles that can greatly benefit from these savings. For example, if you have kids who are moving out or attending college, you no longer have to supply cooling power to their bedrooms. You also can think ahead. Before installing any units, think about which rooms do and don’t need cooling power. Another great savings tip is through the fact that these systems are heat pumps. In particular, we’re talking about the heat pump’s ability to both cool and heat the home by reversing the flow of refrigerant. This is one advantage over central air conditioners that have made heat pumps very popular lately. For those using central air systems, they most likely have a separate heating system installed. In most cases, that also means the homeowner is using two different fuel sources to power those systems. It also means that maintenance must be performed separately on both systems. For a heat pump, both factors are consolidated in the one unit. Heat pumps use electricity and all maintenance is done on the same system. Although it does mean more maintenance must be performed on the machine, heat pumps are still rated with a lifespan rivaling those of central air systems. What’s great about going ductless is that you’re essentially eliminating the middleman. In a central air conditioning system, the ducts are required to transport cool and warm air through your home. Unfortunately, there can be gradual energy loss in this process. Even the best-fitted system of ducts will eventually loosen up over time, resulting in leaks and disconnects for all of that precious air to go wasted. With ductless heat pumps, this problem never even enters the equation. All cooling and heating are done directly in the room it’s installed in, meaning there’s no energy loss. The only thing you’ll want to watch out for is that your HVAC contractor does a good job of air conditioning installation in Milwaukie, OR. If the unit is not placed in the best position, it can actually reduce efficiency. We’ll help you find out if ductless heat pumps are a good choice for your home. Contact The Clean Air Act Inc. today!